Ever since I was a snotty kid I loved playing Nintendo. I remember getting a Super NES on my 6th birthday and playing it with my dad in the basement. I attach a lot of good memories to some awesome games I’ve played in my lifetime, and each one reminds me of different time periods in my time here on this planet. Call me lame, call me a nerd, call me whatever you like, I don’t care; I enjoyed having FUN. So in the meantime, I’ll be posting my top ten favorite games of all time over the next week or so, starting with #10 tonight. I won’t be including some games such as WoW and Call of Duty, even though I sank a lot of time into them, they don’t mean much to me personally or emotionally. So here it goes! It’s needless to say how much this game influenced the lives of so many wide-eyed kids in the late 90s. Pokemon started a raging phenomenon that still lives on today. There were Pokemon toys, Pokemon cards, Pokemon bags, Pokemon games, Pokemon everything. I remember printing out a bunch of cheat codes to Pokemon before I ever got the game because I was so excited about it. Of course those codes included the cheap stories made by THAT kid: Pikablu and Mew “tricks” that were complete fakes. One legitimate cheat code I used and abused was the infamous Missingno. glitch. I “exploited” this small mishap to get 99 rare candies to maximize my Pokemon Master Level. I caught one of these buggers once on my little brother’s Red Cartridge (We used to switch back and forth between our red and blue versions when we would beat the game) and it broke the save system. No more saves = no more game. I visited Alabama with my family while I was doing my completele 150 Pokedex run. I vaguely remember the day I finally completed the daunting task of collecting all 150 critters. I clearly remember the exact place I was sitting when I got a bland “congratulations” note from Professor Oak when I went to brag about my accomplishment to him. Anyway, this game has a special place in my heart and always will. Catching your first Pokemon in game was an exhilarating feeling but paled in comparison to beating Brock for your first gym badge. 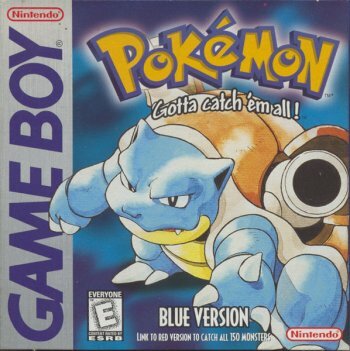 I would still play this game today if I had a Game Boy, but alas it is gone. Wherever that thing is, I’m sure it still works without a hitch.